Once upon a time… this book completely surprised me in the most wonderful way. It wasn’t that I wasn’t expecting it to be good, I was, it’s just that it totally surpassed my expectations. Laini Taylor crafts a seductive Prague, full of back alleyways, vexing ex-boyfriends, occult coffee shops and an honest and tough main character named Karou who’s attending art school. She’s a delightfully odd mixture of tattoos and grace, worldliness and teen angst. Her friends are fascinated with her sketchbooks that are filled with monsters and otherworldly creatures. Things start to get really interesting when we find out that those sketches are from Karou’s secret, other life as an errand runner for a mysterious devil named Brimstone, who collects and trades in teeth. Karou’s job gets trickier when savage angels descend to earth and start destroying the portals she uses to reach Brimstone. To complicate matters further, Karou runs in to an angel named Akiva, and there’s something captivating yet terrifying about him; something she just can’t put her finger on. It’s hard to talk about this book and what made it so compelling without giving something away, nevertheless I will resist the urge, remain strong, and keep my lips sealed! It reminded me of Phillip Pulllman’s His Dark Materials trilogy, because of the fantastic set up of the first novel, which the author proceeds to open in to an entirely new world. Even after you’re entranced with the initial literary magic, Taylor ambushes you with twist after twist – it’s like happening upon a personal surprise party, created just for you, in the middle of an already splendid narrative. I will say that this hybrid world of demons and angels hidden amongst humans was written refreshingly by Taylor. Some times in books that deal with alternate worlds, the human realm can become tiresome and you want to bang your head against the book, yearning to skip to the ‘good parts’. However, that wasn’t the case in Daughter of Smoke and Bone. Karou is mysterious, but she’s juggling pretty human problems. The supernatural elements in this book are wonderful and unique, but they don’t overshadow the elements of the story that make it stimulating and current. 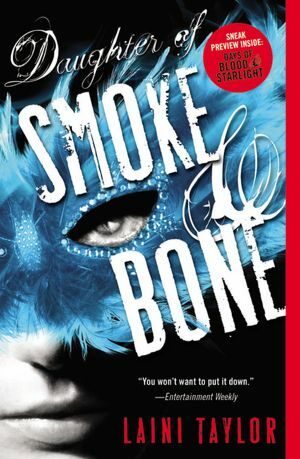 If you’re even slightly intrigued, or on the fence about reading Daughter of Smoke and Bone, let me save you the time; read it! Plus you know you want to be ahead of the curve, and already have read this book before the sequel, Days of Blood and Starlight storms in to book stores in early November. “It’s like happening upon a personal surprise party, created just for you, in the middle of an already splendid narrative.” Such an awesome and accurate description of the experience of reading this book!